What can I say? This is the most amazing, dramatic, show-stopping dessert ever! And if you think it looks good, wait until you taste it! Having a barbeque? Going to potluck? They’ll remember you forever if you bring this to the table. Fruit pizza is basically a giant sugar cookie (of course, my version is a little healthier than most because I use less butter). You bake and cool the cookie and while it’s cooling, you get all the fruit and glaze ready. Then you build your creation. 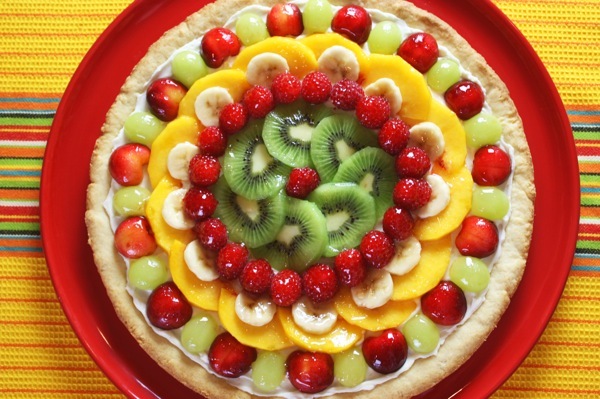 It’s perfect for summer parties but I make fruit pizza all year round. In the summer I use peaches, raspberries, blueberries, nectarines, strawberries, and cherries when they’re more affordable (this one has Queen Ann cherries and yellow grapes on the border). In the winter I use bananas, kiwi, papaya, grapes, mango, and whatever else I can find that’s soft and colorful. If you use bananas, make sure to coat them with lemon juice as soon as they’re sliced to prevent them from turning brown. One Comment on "Fabulous Fruit Pizza"
I agree..it is pretty awesome looking rain coming here so plans cancelled a free days ,I believe you enjoy yourself wherever you are Thanks for the wonderful recipes.